It’s hard for me to believe, but just four weeks ago today I walked out onto centre stage at the Centro de Acción Social por la Música in Caracas to conduct the world-famous Orquesta Teresa Carreño in concert. In my professional work I’m accustomed to perhaps three rehearsals of two and half hours each to prepare a 90 minute program; in Caracas we had met for four hours of rehearsal every afternoon that week from Monday to Friday, plus a Saturday morning dress rehearsal. Breaks were “at my discretion,” I was told by the production supervisor Zobeya Márquez: “Maestro Abreu believes in LOTS of rehearsal.” How about that, so do I.
I’ll post video of the concert as I can find time to put it up (here’s a preview –video not available on mobile). There were some genuine triumphs: the opening work, the Strauss Jr. Emperor Waltz Op. 437 absolutely glowed, and orchestra delivered the closing piece, the Mussorgsky-Ravel Pictures at an Exhibition, with every ounce of energy and brilliance for which the group is famous. But in my opinion, the finest achievement of the group came not in the performance, but in a rehearsal earlier in the week. I had selected Mozart’s Symphony No. 38 (“Prague”) to conclude the first half, and at the initial reading the orchestra had played it with all the energy and brilliance I might expect – of a Tchaikovsky overture. “Fast and loud, it’s what we do,” a senior Fundación administrator had told me in 2010 at the performances of the TC at Royal Festival Hall in London. But it’s not all that they do, because in our second rehearsal of the work, with a string section of at least 60 musicians, we managed to achieve the clarity and transparency of sound the Viennese master requires. And it didn’t come from telling them how to play, what bow stroke to use, or from shouting, but from unleashing them, just in a very, very different way they were used to. Frankly, I wasn’t even conducting. Left to their own intuition and their own ears they conjured a moment of breathtaking beauty, leaving everyone in the room (including themselves) stunned into silence at the end of the passage. We ended up reducing the string section for the performance solely out of pragmatism, but they will not forget what beautiful things they accomplished –unbidden by any conductor– in that rehearsal. Orchestras are extraordinary entities of incredible power and potential, but my profession has yet to figure out how best to unlock their capacities. Authoritarian leadership is the industry norm even today, as demonstrated by this recent story from Dallas. So when Geoff Baker, in his comment in my last entry, stated that in the pursuit of social action through music: “one would not turn to the symphony orchestra, in fact it would probably be at the bottom of the list,” the weight of history and tradition, past and present practice, is firmly on his side. But that’s not a condemnation of the orchestra; it’s a condemnation of the practice. The point I’ve been trying to make for a number of years now is that in conversations of social action through music, issues of medium or genre are largely irrelevant, or at least, secondary to the nature of the practice itself. In Porto Alegre I used the analogy of the hammer, saying it could either build cathedrals or crush bones. It is how the hammer is wielded that makes the difference. I’ve said it before and I will say it again: our tools are dangerous, and the inescapable corollary of their capacity to help is their equal capacity to hurt. 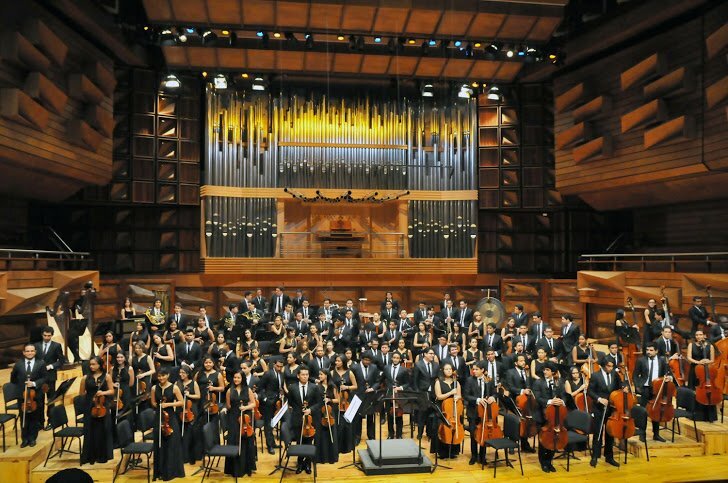 In Venezuela a tool (perhaps not the tool) already exists: they have built an extraordinary national network of orchestras. If there existed the will to wield the tool differently, then their social objectives might be achieved. To use Geoff’s analogy in his comment, I don’t see the glass as empty at all, but in fact as full. The balance of the drink may simply not be quite right. During my stay in Caracas I was asked by a journalist why the idea of social action through the arts might work best through music. I responded that I believed sincerely that it was possible through any of the arts or even sports, but that music offered a unique advantage, that of economies of scale. There can be 20 first violins in an orchestra, but there can only be one Macbeth on stage, only one striker on a football team. The right practice of social action through music could simply reach many more individuals in a more cost effective manner than any other alternative. It’s a pragmatic response (apologies to those expecting poetics) but the orchestra has proven a very pragmatic and successful choice/tool for Venezuela. The Fundación’s choice of genre and medium is directly tied to its international success and its funding. The medium may be colonialist, or Eurocentric, but it also serves as a default cultural common ground world-wide. Audiences around the world have responded to the Venezuelan orchestras with unvarying approbation. Different countries and cultures may ascribe different degrees of value to the orchestra and western art music, but the two are rarely entirely alien and unfathomable, particularly to political classes that tend to be western-educated. The last point is crucial: cultural programming, whether at the public or private levels, often represents an unhappy compromise between what is desirable, and what is fundable. The UK government would never have committed 15 £7.35 Million GBP to In Harmony to date were the emphasis of the program on electric guitars and free improvisation. The optics of the program are directly connected with its political palatability, and the use of the orchestra is an essential element of its popular appeal. And before we decry or deplore the lack of political will, politicians are never motivated by what is right, only by what will improve their chances at election or re-election. It all comes down to be “what should be” vs. “what is.” Should politicians act in the interest of the public, rather than the party? Of course, but they won’t. Should the orchestra be the default cultural common ground of the world? No, but is there as yet a viable alternative? Should the world be more interested and more invested in well-informed, socially-oriented music pedagogy, no matter how that manifests, rather than orchestras blitzing through Mahler and Bernstein? Ideally, yes. But it isn’t. Yet. So the choice may be between a drink that is a little imbalanced, but having the potential to be easily improved, versus the alternative – which in this case is in fact a very empty glass. Empty of funds, empty of public interest, and largely empty of existing activity. As an example of an alternative, Geoff cited Musical Futures, a program I admire greatly, but one still very much on the periphery of music education. Should it be? Of course not. There’s no end to that particularly game, unfortunately. So back to making candles (mixing drinks…and metaphors?) I go. This entry has been updated to correct the total investment of the English government in In Harmony programs to date. Thank you for another well-reasoned post. I think there are actually three positions here, not two: (1) what is; (2) what it could become; (3) what should be. (1) is the status quo, (2) is a reformist vision, and (3) is a revolutionary vision. You’re aligning yourself primarily with (2), I’m more attached to (3). I think both have an important role to play in the world. What’s interesting is how this reveals El Sistema to constitute (1), i.e. the opposite of revolutionary, utopian, and so on (as is normally claimed). At present, El Sistema is a conservative program that reproduces the status quo. Whether that’s good or bad is a different question, but El Sistema has been mis-sold to the world by its advocates as revolutionary and utopian. I’m not an advocate of Musical Futures, I’m simply holding it up as an interesting and quite different alternative. If it’s empty of funds, well, that may not be a weakness; it’s designed to be a low-cost, sustainable program. If it’s empty of public interest, well, that’s because it doesn’t have a big PR machine and lots of compliant journalists behind it. Again, I’m not sure that’s a bad thing, in fact. A pithier encapsulation of teacher-centred learning and its potential for abuse would be hard imagine. I admire your determination to change “what is” and I wish you luck with your efforts to make it a bit more like the hype. I really do. Is there any known precedent of youth orchestras (anywhere) functioning with collaborative/democratic leaning models similar to the Orpheus Chamber Orchrstra and Spira Mirabilis?